The Kobe Prelude Pack celebrates the stories behind some of Kobe’s most defining moments and retail for $200 per pair. 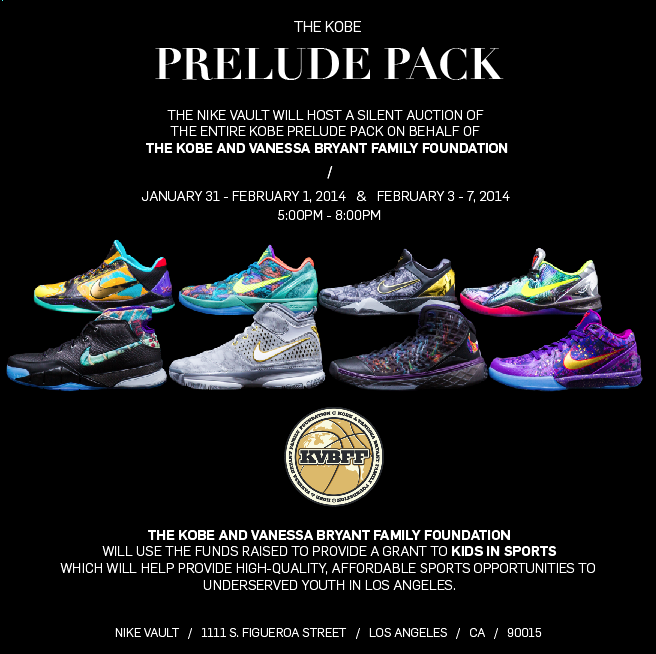 Nike donated the 10 Prelude Packs to The Kobe and Vanessa Bryant Family Foundation (KVBFF) to support Kobe Bryant and his work to provide opportunities for young people in Los Angeles. The funds raised from this silent auction will help provide high-quality, affordable sports opportunities to underserved youth in Los Angeles through a KVBFF grant to Kids in Sports. *If a winning bid is not claimed within 24 hours of announcement, the next highest bidder for the respective Prelude Pack will be contacted as a winner.